Aruba is a 32 kilometer-long island of the Lesser Antilles in the Caribbean Sea, 50 miles (80 km) northwest of Curaçao 18 miles north of the Paraguaná Peninsula of Venezuela. It belongs to the Realm of the Kingdom of the Netherlands, which consists of a European state, the Netherlands, and two Caribbean states, Aruba and the Netherlands Antilles. Aruba has a land area of 75 square miles (193 km²) and lies just outside of the hurricane belt. 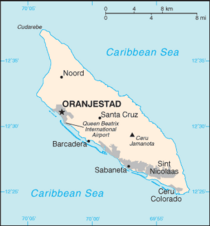 The capital and main port is Oranjestad. The original native people of Aruba and surrounding islands were the Arawak Indians. This heritage is stronger on Aruba than on most other Caribbean islands. Though no full-blooded Aboriginals remain, the features of the islanders clearly indicate their genetic heritage. 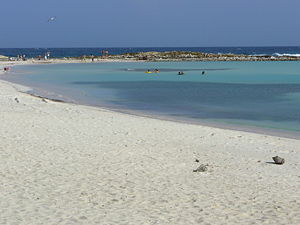 Unlike much of the Caribbean region, Aruba has a dry climate and is considered a generally flat, river-less island renowned for its white, sandy beaches. This setting has strengthened tourism, which is its number one economic strength and has earned it the name, "the Las Vegas of the Caribbean". An island of the Lesser Antilles, located within the Leeward Antilles island arc, Aruba is a generally flat, river-less island renowned for its white, sandy beaches. Most of these are located on the western and southern coasts of the island, which are relatively sheltered from fierce ocean currents. The northern and eastern coasts, lacking this protection, are considerably more battered by the sea and have been left largely untouched by humans. To the east are Curaçao and Bonaire, two island territories which form the southwest part of the Netherlands Antilles; Aruba and these two Netherlands Antilles islands are also known as the ABC Islands. As a separate member state of the Netherlands, Aruba has no administrative subdivision. The interior of the island features some rolling hills, the better-known two of which are called Hooiberg at 541 feet (165 m) and Mount Jamanota, which is the highest on the island, at 617 feet (188 m) above sea level. Immense monolithic boulders of diorite are piled atop one another throughout the island. The island's soil is barren, with little or no natural irrigation. 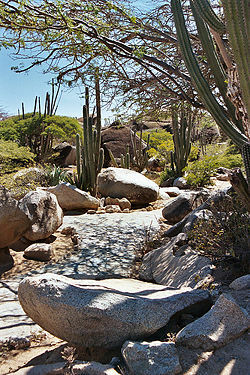 Its natural vegetation is comprised of a variety of drought-resistant trees, shrubs and cacti. Most drinking water is obtained by desalination of seawater. The local climate is a pleasant and tropical–marine. Little seasonal temperature variation exists, which helps Aruba to attract tourists all year round. Temperatures are almost constant at about 28 °C (82 °F), moderated by constant trade winds from the Atlantic Ocean. Rainfall is low and variable, with annual precipitation barely reaching 20 inches (500 mm), with most of it falling in late autumn. The island lies outside the usual path of hurricanes. Arikok National Park is a preserve of desert resources, including several indigenous species. The National Park takes up approximately 18 percent of this tiny island, including three primary geological formations, the Aruba lava formation, a quartz diorite formation, and a limestone formation that extends inward from the coast. 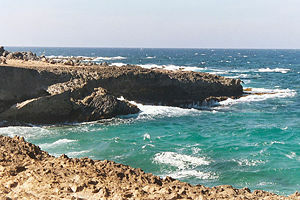 These formations have directly influenced Aruba's human settlement, as well as its natural wonders. Aruba is home to several species endemic to the island, including two unique species of snake and two bird species. Rock outcroppings also create micro-climatic conditions to support these unique plant and animal species, as well as settlements. These are located within the Arikok National Park almost exclusively. The two snake species are the cascabel (Crotalus durissus uni-color), and the santanero (Leptodeira bakeri), called the (Aruban) Baker's cat-eyed snake. The shoco (Athene cunicu-laria arubensis), known as the Aruban burrowing owl, and the prikichi (Aratinga pertinax arubensis), the Aruban parakeet. Another indigenous species, the kododo blauw (Cnemido- phorus arubensus) is the Aruban whiptail lizard. Inside the park are some of the island's oldest Arawak paintings, which have drawn attention from the government. First designated as an important national area in the 1980s, Arikok National Park is home to popular hiking trails, covering all kinds of terrain from hills to gold mines, and even plantation ruins. Aruba's first inhabitants were the Caquetioss of the Arawak tribe, who migrated there from Venezuela to escape attacks by the Caribs. Fragments of the earliest known Indian settlements date back to about 1000 C.E. Due to Aruba's mostly distant location from other Caribbean islands and strong currents in the sea which made canoe travel to the other islands difficult, the Caquetios remained tied more strongly to South America than to the Caribbean. Aruba was discovered by Spanish explorer Alonso de Ojeda and claimed for Spain in 1499. Although he established a colony there, it was limited in scope. Unlike many other Caribbean islands, no plantation society evolved on Aruba. Instead, the Spanish sent many Caquetios to Hispaniola, where they were enslaved in the mines. In 1636, Aruba was acquired by the Dutch and remained under their control for nearly two centuries. In 1805, during the Napoleonic Wars, the British took control of the island, but it was returned to Dutch control in 1816. The island's economy has been dominated by four main industries: gold mining, aloe export, petroleum, and tourism. Though gold was discovered in the nineteenth century, the economy remained weak until the construction of an oil refinery at Sint Nicolaas in the 1920s. In 1976, preparing the people of Aruba to exercise Aruba's Self-determination Right and Independence, the National Flag and National Anthem were introduced by special committee. The National Flag symbolized Aruba's "Status Aparte," obtaining thereby for Aruba the status of an autonomous state, with special ties with the Commonwealth of Nations. In 1977, the first Referendum for Self Determination was held with the support of the United Nations. In 1983, Aruba reached a final official agreement with the State of the Netherlands, the State of the Netherlands Antilles and the Island Governments, to become a Member State within the Kingdom of the Netherlands, with its own Constitution. Aruba's constitution and autonomy were unanimously approved and proclaimed in August 1985, and an election was held to determine the State of Aruba's first national parliament and institute its first national government. In 1986, Aruba seceded from the Netherlands Antilles and became a separate, autonomous member of the Kingdom of the Netherlands, under the Dutch crown. This achievement was largely due to the diplomatic prowess of the late Betico Croes and the support of nations such as the USA, Panama, Venezuela and various European Countries. The governments of Aruba, the Netherlands and the Netherlands Antilles in 1994 jointly decided to indefinitely postpone the transition to full independence. As a Constituent Country of the Kingdom of the Netherlands, Aruba's politics take place within a framework of a 21-member Parliament and an eight-member Cabinet. The governor general is appointed for a six-year term by the monarch, and the prime minister and deputy prime minister are elected by the Staten (or Parliament) for four-year terms. The Staten is made up of 21 members elected by direct, popular vote to serve a four-year term. Together, the State of the Netherlands, the State of the Netherlands Antilles, and the State of Aruba form a Commonwealth. As they share the same Dutch citizenship, these three countries also share the Dutch passport as the Kingdom of the Netherlands passport. Aruba recognizes a local citizenship for the island, and reserves some privileges and rights for Arubans. Legal jurisdiction lies with a Court of First Instance, a Common Court of Justice of the Netherlands Antilles and Aruba and the Supreme Court of Justice of the Netherlands. There is no indigenous military of Aruba, defense is the responsibility of the Kingdom of the Netherlands. The Netherlands Military forces that protect Aruba include the Royal Netherlands Navy, the Netherlands Marine Corps and the Netherlands Coastguard. An increase of instability in South America, specifically Venezuela, prompted the Netherlands to heighten the security level and increase monitoring of the island in cooperation with the United States. The Netherlands Antilles conducts foreign affairs primarily through the Dutch government, however, Aruba has strong relations with other Caribbean governments. Aruba is an observer in the Caribbean Community (CARICOM), an associate member of the World Trade Organization through the Netherlands and is a full member of the Association of Caribbean States. Prior to the 1800s, the island of Aruba had been used mainly for horsebreeding by colonial administrators, who used the native population as herdsmen. Efforts were made in the next century to grow aloe for export, but interest was small. In the 1820s gold mining came to the fore, but had ceased by the early 1900s. From the 1920s to the mid-1980s oil refining supported the island. A financial crisis ensued with the closing of the refinery in 1985. Since the end of oil refining on the island, tourism has been strongly promoted. Due to the growth of tourism, Aruba enjoys one of the highest standards of living in the Caribbean region, with the lowest crime rate and low poverty and unemployment rates. Because of the focus on tourism and the number of resorts, luxury hotels and casinos on the island, Arubans enjoy a very low unemployment rate. The island has become known as "the Las Vegas of the Caribbean." 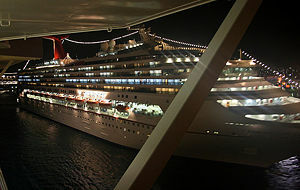 Cruise ship in port, Aruba, 2006. Tourism and related industries provide approximately half of the state's income. Most tourists come to the island from Canada, the European Union and the United States, which is one of the island's largest trading partners, along with Venezuela, and the Netherlands. Because of tourism's rapid growth in the last ten years, related industries, such as construction, have also flourished. Although the island's poor soil and low rainfall limit its agricultural prospects, aloe cultivation, livestock, and fishing contribute to Aruba's economy. With such a large part of its economy dependent on tourism, the Aruban government is striving to increase business in other sectors to protect against possible industry slumps. Their current focus is on expanding technology, finance, and communications. The development of a free-trade zone and plans to develop Aruba into an international offshore financial center are in the works. In addition, the country exports art and collectibles, machinery, electrical equipment, and transport equipment. Aruba's small labor force and low unemployment rate have led to a large number of unfilled job vacancies, despite sharp rises in wage rates in recent years. The G.D.P. per capita for Aruba is calculated to be around $23,600.00; one of the highest in the Americas. Deficit spending has been a staple in Aruba's history, and modestly high inflation has been present as well, although recent efforts at tightening monetary policy may correct this. Aruba receives some development aid from the Dutch government each year, which decreases each year and will cease completely in 2009. Most of Aruba's population is racially mixed, with a huge percentage containing Aboriginal ancestry, though no full-bloods remain. The majority of the population is descended from Arawak, in combination with Dutch, Spanish, and African ancestors. Since there was no plantation economy due to the island's poor soil, the few slaves used in the gold mines were Arawak. African slaves were not brought in, resulting in Aruba having the distinction of having one of the longest lasting non-integrated Arawak tribes in the region. The Arawak culture is still evident in language and traditions. The Arawak heritage is stronger on Aruba than on most Caribbean islands. Recently there has been substantial immigration to the island from neighboring Latin American and Caribbean nations, attracted by the lure of well-paying jobs. 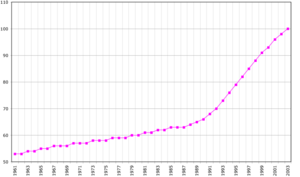 Population of Aruba, Data of FAO, Number of inhabitants in thousands, 2005. 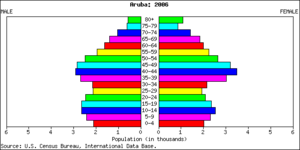 Languages: Dutch (official), Papiamento (national language), Spanish, English. Language is an important part of Aruba's culture. The cultural mix has given rise to a linguistic blend known as Papiamento, the predominant language on Aruba. The two official languages are the Dutch language and Papiamento. Papiamento has evolved through the centuries and absorbed many words from other languages such as Spanish, Dutch, English, African dialects, and Portuguese. However, like many islands in the region, Spanish is also often spoken. The English language has historical connections due to the British Empire's rule and is known by many; the usage has also grown due to tourism. Other common languages spoken are Portuguese, Chinese, German and French depending on the size of the individual communities. The latter is offered in high school and college, since a high percentage of Aruban students continue their studies in Europe. In recent years, the government of Aruba has shown an increased interest in acknowledging the cultural and historical importance of its native language. Although spoken Papiamento is fairly similar among the several Papiamento speaking islands, there is a big difference in written Papiamento. The orthography differs from island to island and sometimes even between groups of people on the same island, variously utilizing either the Dutch or Portuguease roots. In the book The Buccaneers of America originally published in 1678, it is written that by eyewitness account the Indians on Aruba spoke Spanish. The oldest government official statement written in Papiamento, dates from 1803. Aruba has four newspapers published in Papiamento: Diario, Bon Dia, Solo di Pueblo and Awe Mainta and two in English: Aruba Today and The News. Aruba also has 18 Radio Stations (2 AM and 16 FM) and three TV stations. Islanders can often speak four or more languages and are mostly Roman Catholic. 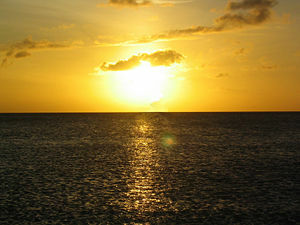 The origins of the population and location of the island gives Aruba a mixed culture. Dutch influence can still be seen, as in the celebration of the "Sinterklaas" Day on December 5 and 6, and other national holidays such as "Dia di Reina" (Koninginnedag) when Aruba and the Dutch Kingdom celebrates the Queen's birthday each year on April 30. Christmas and New Year's are celebrated with the typical music and songs of gaitas for Christmas and the dande for New Year's. The "ayaca," the "ponchi crema" and ham along with other typical foods and drinks are eaten on these days. Hundreds of thousands of dollars worth of fireworks are set off at midnight on New Year's. Tourism from the United States has recently also increased the visibility of American culture on the island, with such celebrations as Halloween and Thanksgiving Day. In June the celebration of the "Dia di San Juan" (Saint John's Day), with the song of "Dera Gay" and bright vivid colors of carnival cover the island. The holiday of Carnival is important in Aruba as it is in many Caribbean and Latin American countries, and is related to Mardi Gras celebrated in New Orleans. Its celebration in Aruba began during World War II, believed to have been influenced by the American Troops from New Orleans stationed on the island. Over the years the Carnival Celebration has changed, now beginning in early January and continuing until the Tuesday before Ash Wednesday. A large parade on the last Sunday of the festivities closes the celebration. ↑ Central Intelligence Agency, Aruba The World Factbook. Retrieved January 20, 2012. One Happy People Aruba Guide. Retrieved September 21, 2007. Hartog, J. 1961. Aruba, past and present; from the time of the Indians until today. Oranjestad, Aruba: D.J. DeWit. Central Bank van Aruba. Central Bank of Aruba. Aruba Ports Authority. Aruba Ports Authority. Aruba Airport Authority. Reina Beatrix International Airport. Government of Aruba Tourism site. Governmental Tourism Portal. University of Aruba. University of Aruba. This page was last modified on 19 April 2016, at 14:57.